A few weeks ago, I was honored to be invited to be the featured guest on Caregiver SOS radio in San Antonio, Texas. In addition I was invited to speak to the Caregivers of the Laredo Stroke Support Group, in Laredo, Texas. One exciting part about these two events was that one was on February 13, and the other on Valentine’s Day. They were one right after the other. I took the opportunity to fly out to Texas to participate in both of these opportunities in person, rather than doing them in an online meeting or via a phone call interview. Both events were extremely successful. I enjoyed them immensely. After I gave the Laredo Caregivers a few hints on how to enjoy their role as Caregiver a little more, they were treated to a Caregiver Respite party. 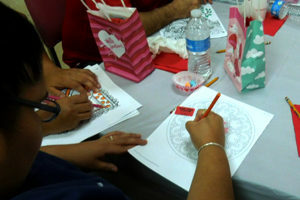 The image above shows them being creative with color pencils and Valentine’s Day coloring pages from ColorMeCaring.com. The radio interview with Carol Zerniel and Ron Aaron aired on February 19th. Here’s where you can listen to the radio show podcast. Onward to the next events! If you would like me to present to your Stroke Support Group Caregivers, contact me via a comment in this blog. We’ll make it happen.